A small streaming device with a unique twist, but can it justify the service fee? Small, lightweight and easy-to-use with great picture quality. A slow media browser requiring Java and a monthly service fee. If the ability to mirror almost any screen and play nearly any web video on your television is your goal, then this device is definitely one to consider. The design is what you would expect from a streaming stick - small device with an HDMI plug and USB port. One of the things that this device has that most in its category don't is an external antenna. As this is a device that is likely to be stuck behind a television, reception is going to be one of its main hurdles to overcome. The inclusion of the rotatable external antenna does seem to alleviate this problem. We were able to receive perfect signal strength on this device from across the building - something we aren't capable of accomplishing with the Xbox One, PlayStation 3 or any phone. The YouBeam is definitely a physically well-built device. The HDMI and USB aspects are molded in place solidly, preventing them from breaking even with consistent moving about. The company even went so far as to gold-plate the HDMI plug, helping to prevent corrosion and improving connection to the television. The antenna has a small gap between it and the rest of the body, giving a little wiggle room which could cause problem down the line, especially if you carry it with you for presentations, etc. Overall, however, there is little to be concerned about with the physical quality of this device. First, let's get the physical compatibility out of the way; it connects to your television via HDMI. If you do not have HDMI, then chances are this product category is not for you. With that said, let's talk about streaming compatibility. For direct screen mirroring, the YouBeam is compatible with both Miracast and DLNA. This means it will work with just about any mobile device out there. We tested it with a variety of mobile devices, all with easy success. Included in our test were a Microsoft Surface Pro running on Windows 8.1, a Nokia Lumia 635 running on Windows 10 for Phones and a Motorola Moto X running Android 4.4.4. The two running published systems ran as expected, the Windows 10 device ran as well as could be hoped for an early preview build (screen did not rotate). As for media source compatibility, it would appear that just about any website serving video files can be the source for the YouBeam. We tested big sites, like YouTube and Netflix, as well as smaller volume sources like our site and TPN.tv. All of the sites we tested were able to be detected in the streaming software and their media pushed to the television. This included Adobe Flash, Microsoft Silverlight and HTML5-powered players. The only real downside in compatibility is in the streaming controller software itself. The program runs on Oracle's Java as opposed to native code. This means that you must have Java running on your computer to use the controller. Unfortunately, Java is a known security risk, so the decision to install this software should not be made lightly. Removing Java from the equation could make this a near perfect compatibility. The setup of this device is a little tricky. First, your controlling computer must be using Wi-Fi. So, if your laptop is on your lap and connected via Ethernet: unplug it. You're going to connect directly to the YouBeam to configure your wireless settings, such as network name and password. If you have no password setup, this process is easier, though so is connecting to your home computers. 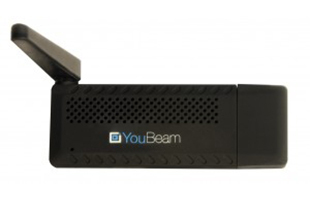 Before you connect, you'll need to install and launch the YouBeam software, which is also a little tricky to get going. I had an issue where my license could not be found because I logged into my account and changed my password before configuring the software. I never did get to login with the changed password, but was forced to use the original one, which made it very hard, as I had all but forgotten what was originally set. Luckily, once the initial setup process is complete, the hard part is over. If you are considering this product for a friend or family member who is not technically savvy, be nice and set it up for them. With its wide variety of connection options, we played content from a variety of devices. We tested streaming through the accompanying app, as well as screen mirroring on several platforms. I define picture quality by the sharpness of the lines, quality of the colors and readability of text. Browsing for media through the application is not fast. The amount of time it takes to render a page is surprisingly slow, though you will will not be using it to browse too often. I found that locating the content in Internet Explorer or Chrome and pasting the URL into YouBeam was far better. Once the media is located, initial playback takes a little while to start, but once the device has the media streaming, the video quality is top-notch. Ideally, the YouBeam software itself would be phased out in favor of a browser plug-in for Chrome, IE and Spartan or Windows service. There is a slight lag between interacting on the phone and the image on the screen updating, but that is likely due more to limitations in the Technical Preview for Windows rather than the device itself. The image quality was as good as on the phone itself, meaning the screen replication was a direct map. I played Netflix on the phone and watching it on the screen, and there was no lag, skips or jumps in playback. The quality wasn't as high as streaming on an Xbox One, but that has to do with the quality of picture Netflix streams to a mobile device. The lag on the Moto X was slightly greater than that of the Lumia, but was still not enough to make using it impossible. The screen mirroring was also a direct mapping, leaving the picture quality high. Unlike the Lumia, however, the Moto X did skip occasionally while playing Netflix, but while the streaming behaved, the picture quality was as good as on the phone's screen. The skipping during playback is likely a function of the Moto X itself, and not a symptom of the device. The Moto X has displayed this symptom on other Miracast receivers. The usability of the device is slightly varied by the intended usage. In using it for screen mirroring, the process of pairing and streaming is incredibly easy, and the quality of the picture is very high. It works with essentially all screen mirroring technologies, and does it well. On the other hand, using it for streaming through the YouBeam application is a little less than perfect. The software itself is not quick to use, requires Java and has a monthly fee. It does, however, do its job well - once the media content is found and streaming begins, the quality is high and does not skip or lag. The variance between this device and normal stick or set-top-boxes, being able to stream almost any media from any website, makes the service fee a potentially acceptable requirement.